Children who read well do better in other subjects, and in all aspects of school and beyond. Reading skills correspond directly to one’s ability to be an informed citizen, communicate effectively, earn a higher salary, and succeed in one’s chosen career. If you read one book per month for 12 straight months, you will be in the top 25 percentile of the world's intellectuals. Having a parent or other caring person read aloud with their children helps children learn listening skills, vocabulary and language skills, as well as develop imagination and creativity. Simple things like reading and telling stories to a child at 18 months are powerful stimuli for brain development in the early years. Establishing a culture of learning encourages an exchange of ideas, enriches family relationships, and bolsters confidence and independent thinking. Students participating in a high quality after-school program went to school more, behaved better, received better grades and did better on tests compared to non-participating students. 70% of inmates in American prisons read at or below a 4th grade level. Until third grade, children learn to read. After that, they must be able to read in order to learn. Children who do not read on level by the end of third grade have only a 1 in 8 chance of ever catching up and are 4 times more likely to drop out of school. Only half of 3rd graders read daily. 65% of America’s fourth-graders read below a proficient level. Children growing up in homes with at least 20 books get 3 more years of schooling than children from bookless homes, independent of their parents’ education, occupation, and class. About 80 percent of students in low-income families do not read proficiently. 51% of adults in Texas read below an eighth grade reading level. By 2030, Dallas County will be home to 1 million illiterate adults. Team Read students average 11.2 months of growth in 7 months of instruction. 96 percent of 2018 Summer Camp students did NOT experience Summer Slide. R2L uses the proven DRA2 and ISIP learning assessment platforms to periodically measure student progress, meaning that instructors can tailor their guidance for each child. Each child in R2L’s programs receives consistent individual instruction, guidance, and support, so they receive the personal attention they need to flourish into strong readers. R2L houses a library of over 6,000 children’s books, and community members can check out books to take home. Low-income children who can’t read on grade level in third grade are six times less likely to graduate from high school. In Dallas, economically disadvantaged students pass STAAR tests half as often as their peers. Dallas children face steep racial disparities in third grade reading. While 58 percent of Dallas’s white students pass 3rd grade reading STAAR tests, only 21 percent of black students and 33 percent of Hispanic students pass. Researchers at Johns Hopkins University concluded that two-thirds of the achievement gap between lower- and higher-income youth results from unequal access to summer learning opportunities. 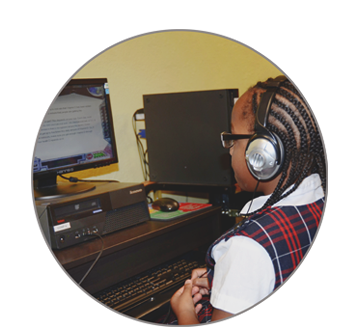 Readers 2 Leaders' mission is to develop and grow the reading skills of underserved Dallas children ages 3-12 so that they succeed in school and graduate prepared to live productive lives. R2L Volunteers are essential to the success of our programs. Sign up today to help a child in need. Help us build a better future for the children of West Dallas by making a donation to support the R2L programs. We offer a variety of programs that help equip the children of West Dallas for a brighter future.